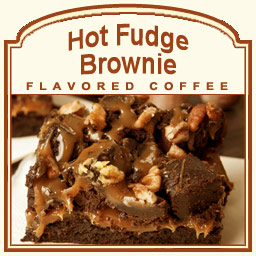 The Hot Fudge Brownie flavored coffee has a deliciously thick flavoring of chocolate, vanilla, and nuts. If you like Southern pecans and maple walnuts, this delicious coffee will hit the spot and make your mouth water for its infusion of chocolate flavor and subtle nutty undertones. With only 2 calories, this 100% Arabica bean coffee will satisfy your taste buds. In a heat-sealed valve bag, this Hot Fudge Brownie flavored coffee features a fresh roasted flavor that will be roasted and shipped on the same day. 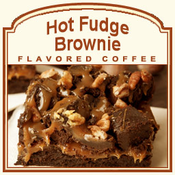 Let the Hot Fudge Brownie taste fresh out of the oven � even if it�s from your coffee pot. Mmm � delicious!